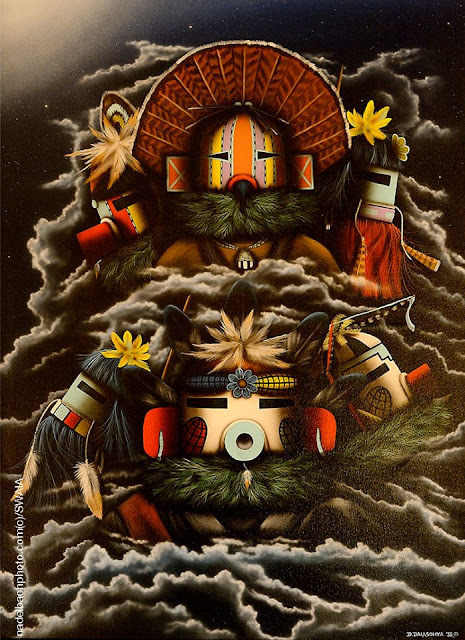 The winning work at the 2015 Santa Fe Indian Market once again reflected the wide variety of talent in Indian country, and pieces demonstrated both a mastery of traditional techniques and modern innovation. The list includes some familiar names, among them Jackie Larson Bread, best of show winner from 2013, and Jamie Okuma, a three-time best of show winner who took home the Class VII: Diverse Arts prize this year for an installation of mannequins in garments called "The Haute Couture of the Indigenous Kind: Yesterday and Today" created with her mother Sandra Okuma. Below are the winners, in photos posted to facebook.com/SWAIA, as well as the official list, which also includes the Class IX: Youth and Class X: Moving Images winners. 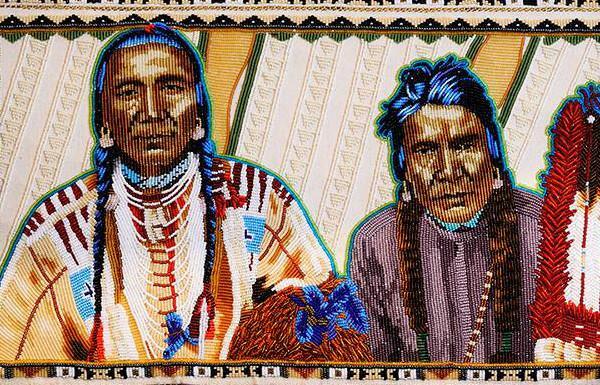 Beadwork & Quillwork winner, Jackie Bread (Blackfeet), '1892 Ledger Book with 6 Ledgers and Portrait of Blackfeet Men,' cut and seed beads, 1892 ledger book and antique papers, materials, colored thread, appliqué stitch beadwork, lazy stitch embroidery techniques. Photo: Daniel Nadelbach. Painting, Drawing, Graphics & Photography winner, David Dalasohya (Hopi/ Laguna Pueblo), 'Mixed Kachinas' (Cloud Form) acrylic on canvas, 36 x 48”. Photo: Daniel Nadelbach. 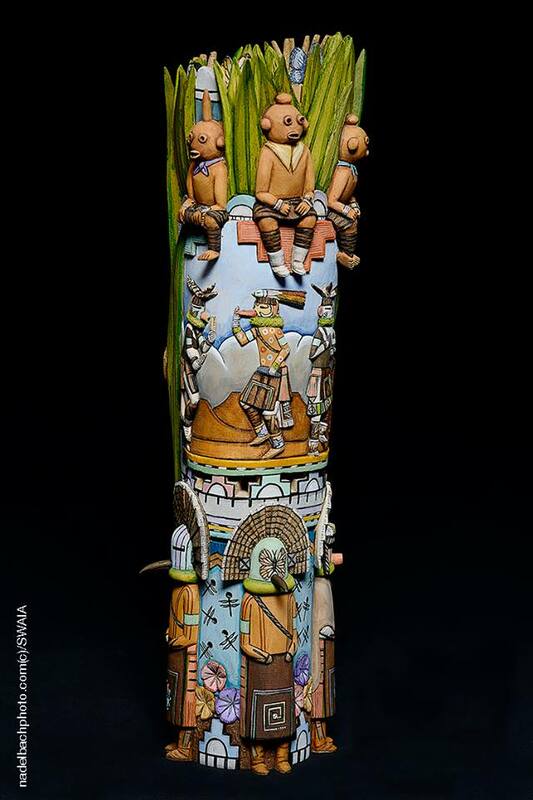 Wooden Pueblo Figurative Carving & Sculpture winner, Bryant Mavasta Honyouti (Hopi), 'Depiction of Corn Dancers,' Multiple figure wood carving with attached Katsinas, 16”, hand-carved Cottonwood root, wood-burned relief, and acrylic paint. 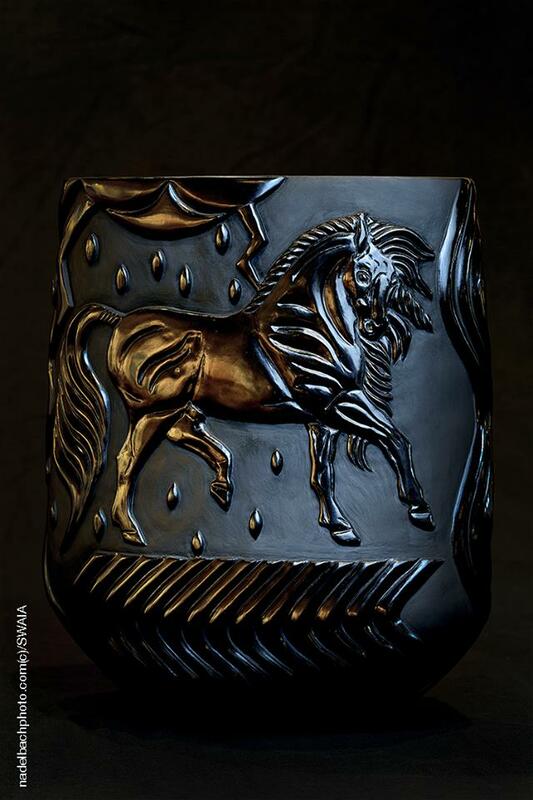 Photo: Daniel Nadelbach. Pottery winner, Nancy Youngblood (Santa Clara Pueblo), 'Horse Running through the Lightning and Rain,' Santa Clara Pueblo Clay pot, Native out-door firing, stone polished. Photo: Daniel Nadelbach. 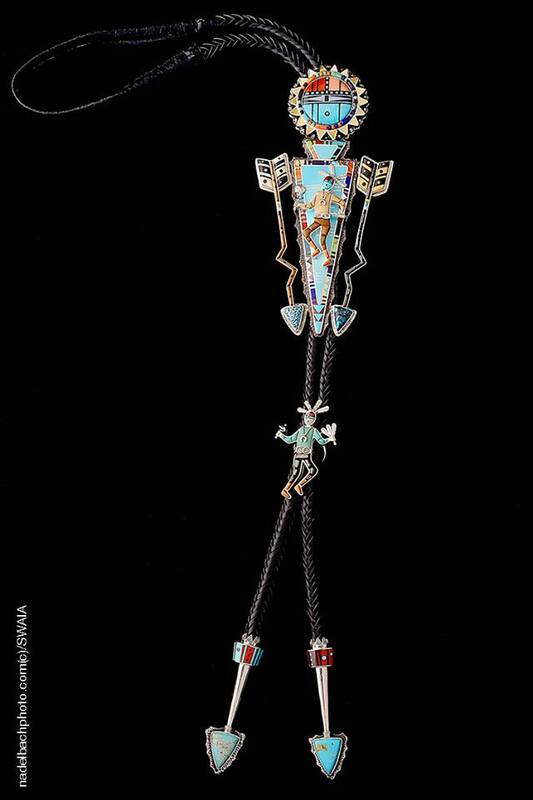 Jewelry winner, Ernest Benally (Navajo), 'Bolo on Handmade Leather', 26” Bolo with handmade Sterling Silver and inlaid gemstones and shells. 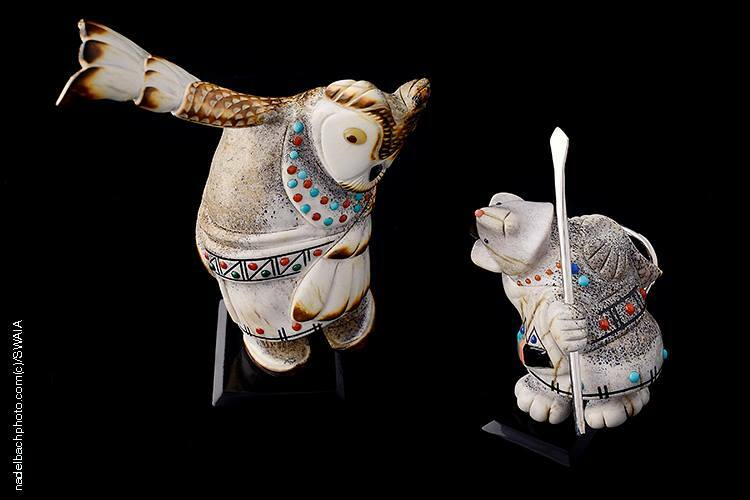 Sculpture winner, Troy Sice (Zuni Pueblo), 'Warrior Mouse and Owl Set,' Carved elk antlers, inlaid with sterling silver, shell and precious stones. 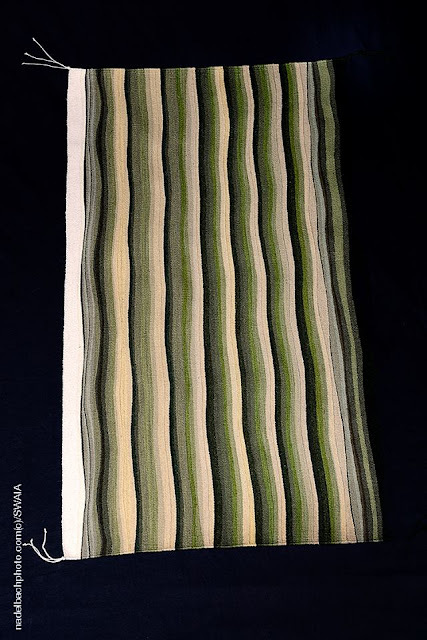 Textiles winner, D.Y. Begay (Navajo), 'Blessings of Rain,' Navajo weaving/tapestry, made of wool. Photo: Daniel Nadelbach. 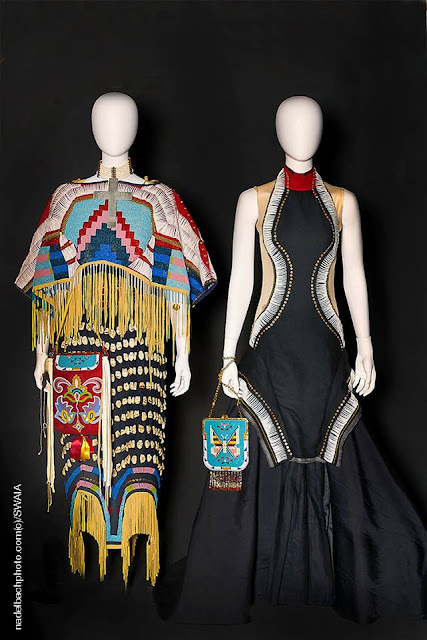 Diverse Arts winner, Jamie Okuma & Sandra Okuma (Mother and Daughter) (Shoshone Bannock/Luiseno), 'The Haute Couture of the Indigenous Kind: Yesterday and Today;' two mannequins together as an installation – concept is Native fashion and its evolution and adaptation to contemporary times; textiles, beading, jewelry, handbags, ornamentation in multiple mediums and materials. Responses to "Masterpieces! 8 Winning Works From 2015 Santa Fe Indian Market"